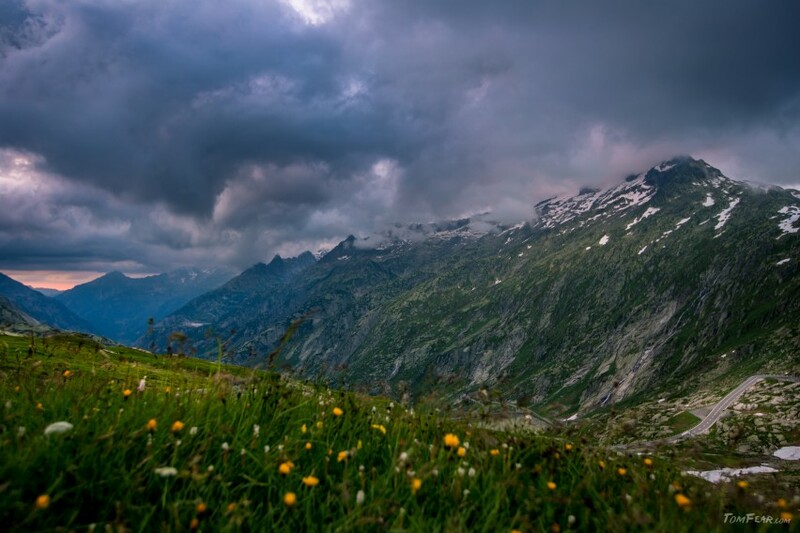 Thick clouds on the top of the Grimselpass. As usual the weather forecast predicted a cloudless sky, but the reality differs a little bit. Okay, they said, the clouds should be gone at this time and the Grimsel area is difficult with clouds, because of all the glacier there. So what, I told me, after a 2.5h drive I am here and therefore I should go up to the mountain. There was a strong wind of about 40km/h and I thought, the wind will blow the clouds away. I have anyway to walk about 800m of altitude and I will reach the peak around midnight, so there is much time for the wind to do his work. 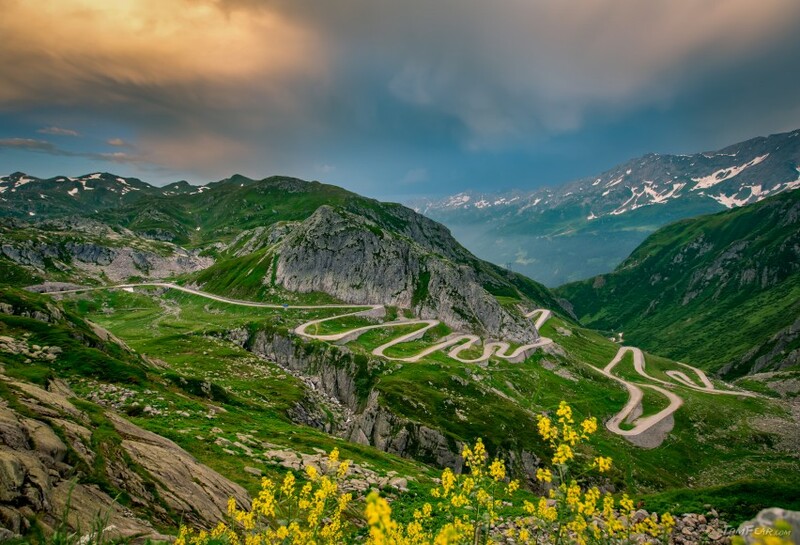 The view over the old Gotthard pass road, called Tremola. 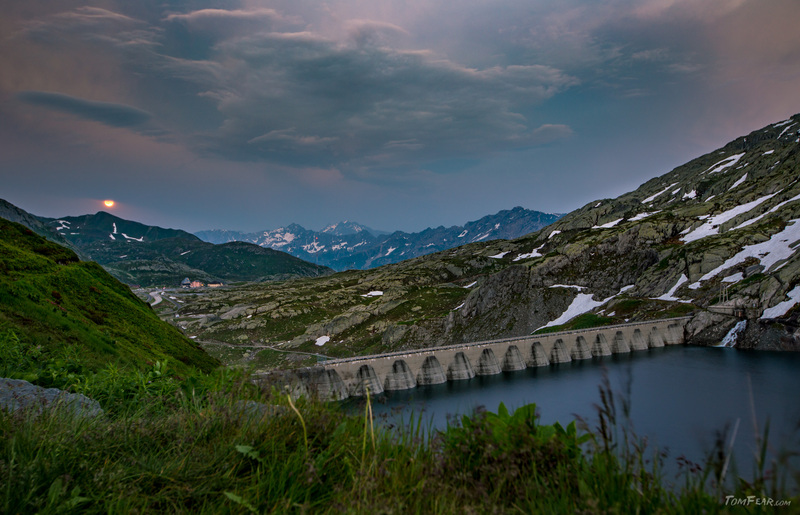 This is a piece of the old road over the Gotthard pass. It leads down to the canton Tessin and this part is called Tremola. There is a wider road behind me, where you normally drive with your vehicle. But this older part is so wonderful curvy. And if you think, wow, that’s cool I will drive this way with my motor cycle, think twice. Because it’s curvy but it’s made of cobblestones and if you drive it, take a piece of rubber hose in you mouth to protect your teeth. With this image I close the trip on the Gotthard and next week we will see some very nice images from my next trip up to the nearly 3000m high Sidelhorn. A short stop on my way back to the civilization. You may know this, you are walking and every few steps you see a new place to stop and take a photo. But escpecially at night I think twice until I take a photo brake. Because I have always take my backpack down and setup my tripod. And you know I’m a lazy guy. But on my way up, I noted this point to take an image and so I stopped, thought a moment whether I should or not. Then I put my backpack on the ground and took some images of the melting water falling down into the barrier lake. 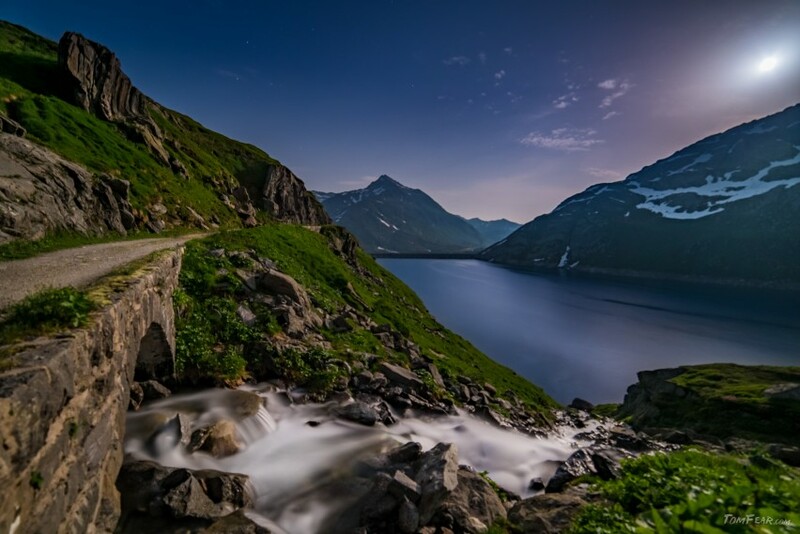 This HDR-Panorama-Night-Image is another picture from my trip in the Gotthard region. And it is also another sample of my out of focus series. 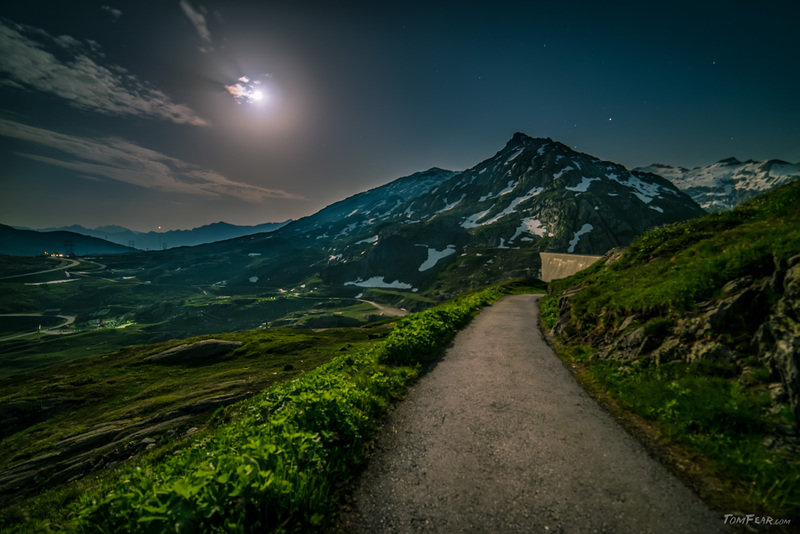 But you can anyway see the mood of this fullmoon night in the middle of the alps. 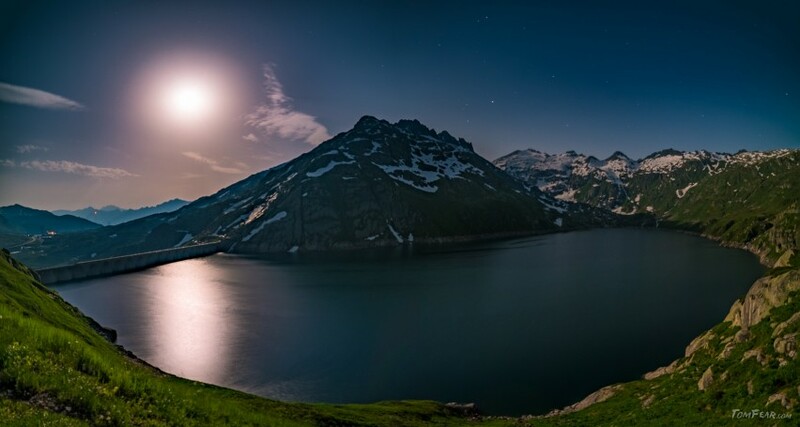 A bright fullmoon is shining to the landscape of the Gotthard region. The landscape is bright and it looks nearly like a daily scene, except the few stars which are strong enough to overrule the power of the reflected sunlight. Full of regret I tested my lens with a canon mount at day again, to find out what happend. Normally this is a very easy lens to get in focus, turn on the focus ring until you are 2mm before the infinity mark and all is fine. But on the the Sony with the FE adapter, strangly the infinity point is now between 0.7m and 1m which is far away where it should be. Well, now I know, actually I allready knew it, I should check the images, after I took it, with a full zoom in. After another hour of walking a steep trail up to a ridge, the moon came over the peak from the other valley side. And the mountain meadow shows me a creek of fresh melted snow, swooshing down in front of me. That’s a good place for a break, I thought and took some images of the the lovely landscape. After I checked the time, I realized, that the day is nearly over and so with a regret, I decided to turn back instead of walking entirely up to the ridge. Therefore I don’t know what great landscape is hiding behind the hill, it seems I have to go again to see what is behind the meadows. The sun is gone, the light is dwindling and the clouds are blowing away. Good, it seems this can be a good night for starscape photos. After the rainshower and all the clouds, was it the right decision to continue walking up into the mountains. 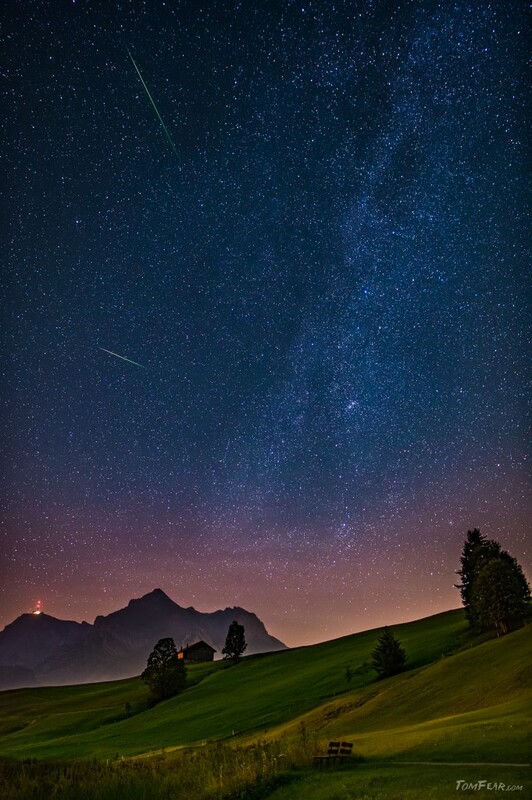 Some of you may already now it, around the 12th of August you can see an intense meteor shower at the sky, each year. If there is no moon and there are no clouds. And after a few years, this year the time was right and all parameters were good or even best. During the week I was checking the weather forecast several times a day and yes, it should clear up at this perfect night. 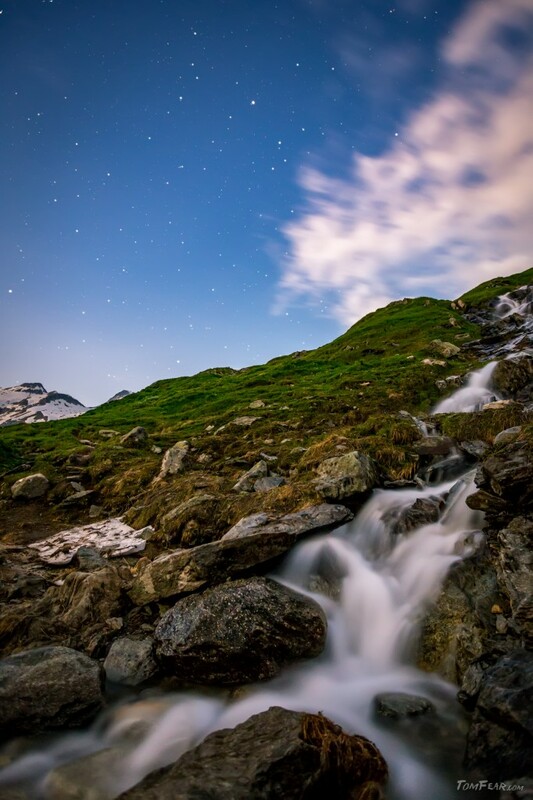 So I was planing my tour and I decided to go to the Toggenburg, especially to the lake of Schwendi. Because I can drive with my car nearly to the lake. Well this might sound like, what a lazy bone Tom Fear is, but I wanted to take some timelapse shots. And so I packed nearly all my equipment. Five cameras, five lenses, four tripods, a dolly and two controllers. All in all, about 25kg, which I wouldn’t want to tow up to a peak. After a half hour of walking, I saw the moon coming up from behind the mountains. I throw my backpack on the floor, built up my tripod and mounted my camera… and the moon was already half hidden behind the clouds. I tried to change the lens for more focal length, but then was the moon fully covered. As you can see, the clouds are covering still nearly the whole sky but it’s early in the evening and only ten o’clock, so I have enough time to walk ahead and see the stars between the mountains. The only rain cloud over whole Europe, was exactly above me. Yes that’s true, I found it again. After driving two and a half hour until I reached the top of the Gotthard pass, it beguns to rain. And with a check on the rain radar app, I had the certainty, it was the only one, a small one just a bit larger than the spot which marks my position on the map. Darn, I thought I could walk to a lake and take photos of a clear night sky and now it rains. But wait! It’s only a small cloud and therefore it is a chance the rain will stop soon, because the cloud is passed by.